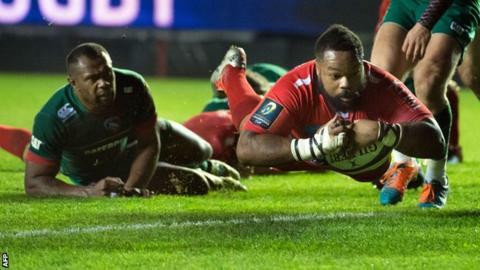 Two-time defending champions Toulon avenged last weekend's European Champions Cup defeat in Leicester as an opening-quarter blitz set them on their way to victory in southern France. Ex-All Black lock Ali Williams blasted over for their first try and Leigh Halfpenny's conversion and three penalties gave the hosts a 16-0 lead. American wing Blaine Scully's try for Leicester made it 16-5 at the break. But Mathieu Bastareaud's converted try ensured a healthy winning margin. Toulon are chasing an unprecedented hat-trick of European titles, having won the last two editions of the Heineken Cup, and they were always on top on Saturday. After their initial pummelling Leicester were game, but they lacked the power to punch holes in the Toulon defence. The hosts, although not at their best, had enough class to stretch their lead at the top of Pool Three to five points and probably end Leicester's European hopes for another season. Toulon's star-studded league of nations dominated the opening exchanges and claimed the first try when second row Williams scored from close range to finish off a thunderous attack. Halfpenny - back in action for the first time since injuring his shoulder playing for Wales against South Africa - converted and added three penalties to give the hosts a 16-0 lead. With Toulon's England exile Steffon Armitage excelling at the breakdown and Leicester's prospective Wales fly-half Owen Williams kicking poorly, both out of hand and off the tee, things were looking bleak for Tigers. But the Leicester fly-half suddenly came to life with ball in hand, and his break through midfield set up the platform for blind-side flanker Jamie Gibson to send United States winger Scully skating over in the corner for an unconverted try. Leicester needed to start well in the second half but although they showed plenty of endeavour they could not break the hosts down. Despite their attacking riches Toulon could only add one more try to their tally, with the 18-stone Bastareaud diving over flamboyantly between the sticks after Argentina fly-half Nicolas Sanchez had stepped his way to within inches of the line. Leicester could only respond with a penalty via Owen Williams' boot and they ended the afternoon having been thoroughly out-gunned. "It was as simple as the fact that we were inaccurate, and you have to be accurate on the big stage. "Owen Williams had a tough day at the office but he is a young guy learning his trade. He will be better for it. Physically we were beaten today by a big, strong team. "Second place is still a realistic position for us. Whether we can get enough points out of our two games though, we will have to see." Toulon: Halfpenny, D. Armitage, Bastareaud, Mermoz, Habana, Sanchez, Tillous-Borde, Menini, Guirado, Chilachava, Botha, Williams, J. Smith, S. Armitage, Masoe. Replacements: Fresia for Menini (72), Orioli for Guirado (59), Hayman for Chilachava (59), Taofifenua for Botha (41), Suta for Williams (67), Gordodze for J. Smith (73). Leicester: Tait, Scully, Smith, Allen, Goneva, O. Williams, B. Youngs, Ayerza, Ghiraldini, Cole, Thorn, Parling, Gibson, Salvi, Barbieri. Replacements: Harrison for Smith (75), Burns for O. Williams (64), Rizzo for Ayerza (64), T. Youngs for Ghiraldini (51), Balmain for Cole (64), Croft for Gibson (59), Crane for Barbieri (51).